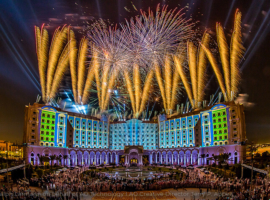 For the celebrations of the National Day of Saudi Arabia an unprecedented multimedia show should be presented. 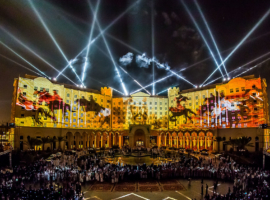 The palatial Ritz-Carlton Hotel in Riyadh provided the backdrop recently for an impressive multimedia spectacle. 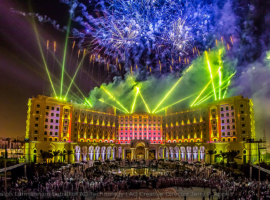 Whilst in classic productions, the disciplines (lighting, pyrotechnics, music…) take turns to occupy centre stage, the Saudi royal family, represented here by the Governor of Riyadh, Prince Turki bin Abdullah bin Abdul Aziz, wanted something very special for this event: that all the professions should interact. To get a show in this unprecedented form up and running, AO Lighting summoned its best creative minds. 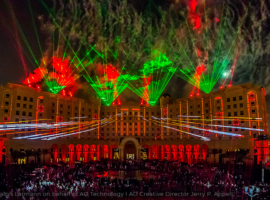 The well-drilled AO Creative team put together a complex multimedia show despite a very tight time frame of only four weeks. So AO Creative created the artistic concept for a show of exceptional quality to mark the anniversary of the formation of the Kingdom of Saudi Arabia. 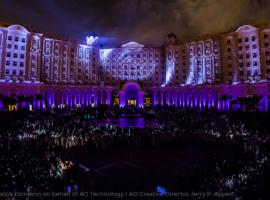 At the same time, an extensive 3D mapping show was staged in the Saudi capital.. The show’s Creative Director was the renowned lighting designer Jerry P. Appelt, who took charge of both the show concept and the lighting design. The entire ochre front façade of the hotel complex was used here as a projection surface. 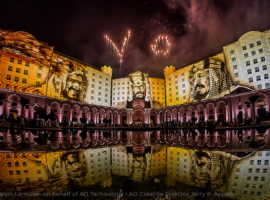 As though on an oversized movie screen, the past, present and future of Saudi of Arabia with its capital Riyadh were depicted in sublime images and video sequences – accompanied by gripping music. It was the first time in Saudi Arabia that the different disciplines within a show were seen to interact. Also the large-scale 3D-Mapping- Show celebrated its premiere in this Kingdom. 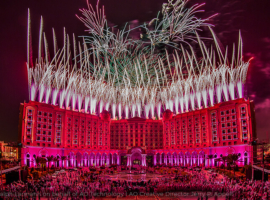 Lights visible for miles around and an impressive firework display crowned the show, which drew an enthusiastic reception from the cream of Saudi society.